Laikā no 19. līdz 20. jūnijam Dānijā tiek rīkots izglītojošs velo pasākums, kurā Latvijas Riteņbraucēju apvienība mudina piedalīties par veloinfrastruktūru atbildīgās amatpersonās no Latvijas. Galvenais fokuss būs vērsts uz veloinfrastruktūras plānošanu maza un vidēja izmēra pilsētās. Zemāk apskatāma pasākuma rīkotāju sagatavota informācija angliski, jo tā būs pasākuma darba valoda. 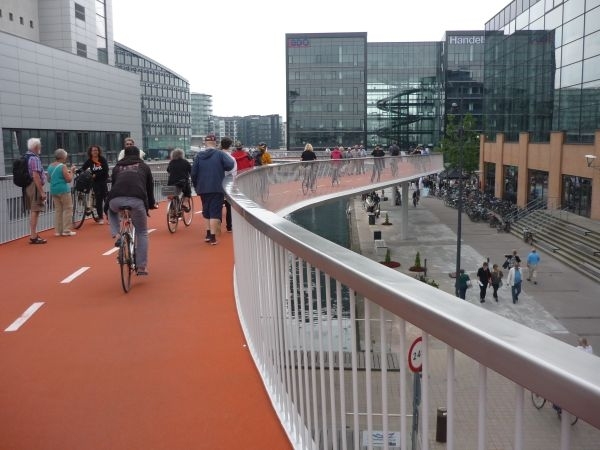 The study trip will deal with planning of cycle facilities in small and medium sized cities as well as regional connections. Political aspects – from vision to reality – will also be dealt with. The study trip will include lectures on Odense (200.000 inhabitants) and Hillerød (50.000 inhabitants) as well as several bike excursions in and outside Copenhagen. Bicycle excursion in central Copenhagen, passing Dronning Louises Bro (Europe’s busiest bicycle street) and other high-level bicycle facilities, ending at Cyklistforbundet (Danish Cyclists’ Federation). Klaus Bondam, director of Cyklistforbundet (Danish Cyclists' Federation) and former Mayor of Traffic in Copenhagen: How to campaign for cycling in a bicycle friendly environment. Bicycle excursion to Islands Brygge via the iconic Cykelslangen and Bryggebroen. Thomas Krag, mobility expert and experienced bicycle campaigner: Bringing cycling to the political agenda. Sidsel Birk Hjuler, manager of project "Supercykelstier": Cycle Superhighways in the Capital Region, process and outcome. Troels Andersen, senior traffic planner from Odense Municipality: Odense City of Cyclists, planning, public relations and realization. Jens Erik Larsen and Thomas Krag: Reflections on the day’s excursions and introduction to the last part. Bicycle excursion visiting rush hour traffic at Langebro and the signposted route Havneringen, Inderhavnsbroen and The little Mermaid, ending at the hotel. Bicycle excursion to Østerport Station, S-train with bikes to Hillerød Station, continuing by bicycle to Parforce Gribskov following cycle route L 105. By bicycle to Hillerød Municipality. Jens Erik Larsen, expert in bicycle route planning and signposting: Cycle route planning and signposting in Denmark and abroad. Ivan Christensen, planner at Hillerød Municipality: Bicycle policy of Hillerød. By bicycle to Hillerød Station, S-train with bikes to Hellerup Station. Final excursion on green cycle routes, bridges and cycle superhighways (supercykelstier) back to hotel. End of study tour and goodbye with snacks. Jens Erik Larsen, M.Sc., has since the late 1970’ies worked as a consultant with bicycle route planning in Denmark and other European countries. He has been part of the Danish Road Directorate expert group on bicycle signpost standardization and has made several bicycle maps and bicycle route plans including signposting. Jens Erik is also an experienced organizer of study trips and been guide for cycle trips all over Europe and abroad. Thomas Krag, M.Sc., was director of Danish Cyclists’ Federation 1986-2000 and started his campaigning career as a volunteer about 10 years earlier. Since year 2000 Thomas Krag has worked as a consultant with expertise in mobility and transport behavior. Thomas Krag has been part of the organization of several national and international bicycle conferences. Arrival on Monday, June 18, 2018 with a get-together arrangement in the evening at 19:30. The study trip ends Wednesday, June 20, 2018 at 17:30. Participation cost 1,000 € (650 € without hotel). Early bird participation cost 880 € (530 € without hotel) when signing up February 5, 2018 at the latest. Pre-payment (20%) should be paid by February 5 (or immediately after signing-up by later registration), remainder (80%) should be paid by June 1, 2018. Cancellation fee 20% until June 1, after this date cancellation is not possible. Mail je@friefugle.dk or tk@thomaskrag.com for registration or more info.